The creations of Jamila Lamrani are constructions that both delight and fascinate. They take position between the visible and the invisible. Made with care and patience, her meticulous work assembles a multitude of scraps of fabric, usually black ones, which delimit a space. Thus, matter is transformed, and something light and intangible takes shape. A space that is visible and full and one that is void are conceived. As part of this exposition at Le Cube – independent art room, Jamila Lamrani presents a new artwork, Memory 2, that falls within the three-part Architecture / Sculpture project. 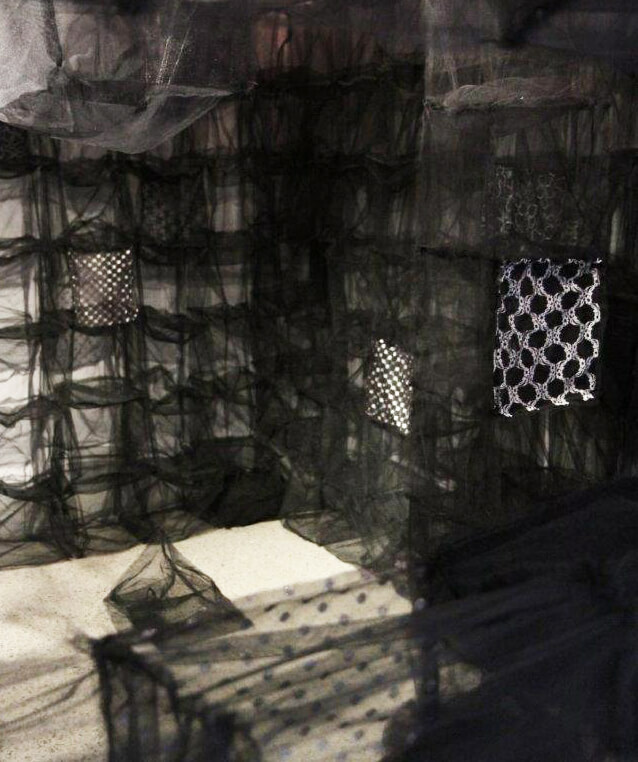 Memory 2 consists of an installation of little cubes made of transparent black tulle, which are suspended in the exhibition room. Thusly, they are enabling the creation of a space within a space, to set a structure up, to trace the limits and to define the territory where action takes place. These cubes that are suspended inside the composition create interplay of the full and the void, between the ceiling and the floor. In contrast with Memory 1, the spectator is not invited to infiltrate the artwork. Only an opening enables him to discover this architecture that plays with shadows and offers a singular atmosphere. Memory 1 has been exhibited at Casa Arabe of Madrid, and Memory 2 is currently presented at Le Cube, in Rabat. Memory 3 is also the expected upcoming project.